ST. JOHN’S, Antigua and Barbuda, August 25, 2014 (ENS) – The twin-island Caribbean nation of Antigua and Barbuda has imposed new regulations to establish five marine sanctuaries protecting 33 percent of the waters surrounding Barbuda. Known as the Blue Halo Initiative, the new rules are intended to enable fish populations to rebuild and habitats to recover in the waters within 5.5 kilometers (3.4 miles) of the Barbuda coast. On August 12 the Barbuda Council signed the new ocean management regulations that zone the island’s coastal waters, strengthen its fisheries management, and establish the marine sanctuaries. 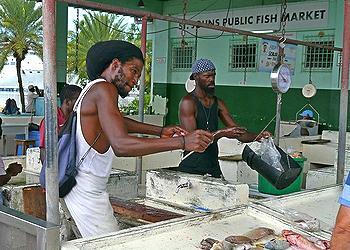 Scheduled for implementation in 2015, the rules will impose a two-year ban on fishing in the Codrington Lagoon. Fishing nets will become illegal in 16 percent of Barbuda’s coastal waters and anywhere within 20 meters (65 feet) of a coral reef. Catching parrotfish and sea urchins has been prohibited, as those herbivores keep algae levels on reefs low enough so that coral can thrive. 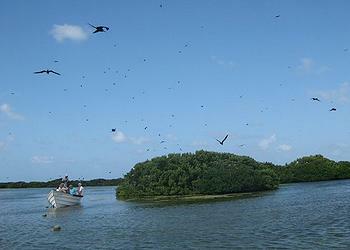 Barbuda is the first Caribbean island to put these measures in place. The new rules of the Blue Halo initiative come after 17 months of community consultation and scientific research with financial support from the Waitt Institute, based in La Jolla, California. The Waitt Institute is backed by philanthropist Ted Waitt, co-founder and former chairman and CEO of Gateway Computers, Inc., which pioneered the direct marketing of personal computers. The Environmental Law Institute, ELI, based in Washington, DC, led the legal analysis and drafting for the Blue Halo Initiative. The Barbuda government is fully behind the Blue Halo Initiative. “This will definitely benefit the people of Barbuda, and Antigua as well. No part of this is meant to hurt fishers. It’s the reverse – ensuring that they have a livelihood that will last in perpetuity,” said Arthur Nibbs, chairman of the Barbuda Council and Antigua and Barbuda minister of fisheries. 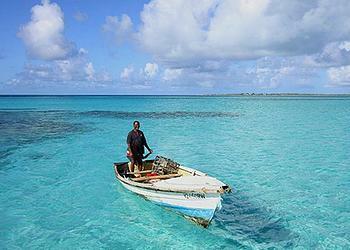 While conservationists and the Barbuda government are celebrating the new rules, Barbudan fishermen are not so happy. The “Antigua Observer” newspaper reported August 19 that people who make their living on Barbuda’s 43 active fishing vessels are appealing to the Waitt Institute and the Barbuda Council to find alternative income sources for them before the rules take effect. Gerald Price, former president of the Fisherman’s Cooperative on Antigua, said while he approves of the new environmental regulations understands the fishermens’ concerns. “There should be, before this actual law comes into effect, an alternative method for how these fishermen will make a living,” Price told reporters on Antigua. He explained that while Antigua fishermen can make a living with carpentry or hotel work, other employment is hard to find on Barbuda. The Blue Halo Initiative is a collaboration among the Barbuda Council, Codrington Lagoon National Park, Barbuda Fisheries Division, Office of the Prime Minister of Antigua & Barbuda, the people of Barbuda, and the Waitt Institute. There is no contract or other formal agreement between the Waitt Institute and the Government of Antigua and Barbuda or the Barbuda Council. The Waitt Institute provides the tools, resources, and training to enable Barbuda to develop and implement new policies for sustainable use of coastal resources. The Waitt Institute makes policy recommendations based on science, case studies, and a deepening understanding of the specific situation in Barbuda. Any party can refuse the Waitt Institute’s recommendations, assistance, or involvement at any time, the Institute says, to counter local fears that it just wants to create fish sanctuaries and stop people from fishing or steal gold from local shipwrecks. The Blue Halo Initiative was patterned after a similar project in Bermuda, also called Blue Halo.